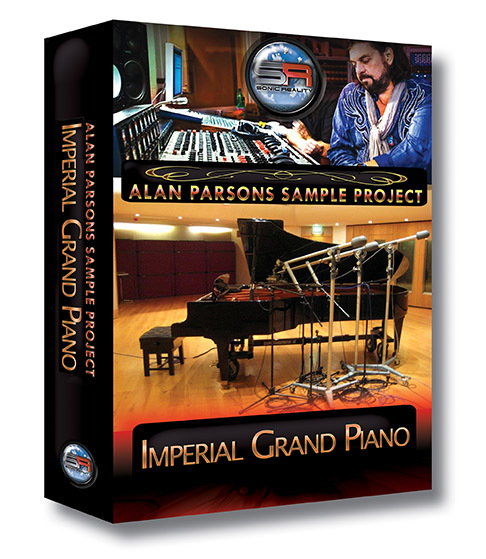 Imminent release of “Alan Parsons Imperial Grand Piano” for Yamaha Motif and popular software sampler formats. January 24, 2014, Sunrise, Florida - Sonic Reality is very proud to announce a new product series with legendary producer/engineer Alan Parsons called The Alan Parsons Sample Project. Each library in the series will focus on a different set of instruments recorded in the style of classic albums Alan has engineered in his career from The Beatles to Pink Floyd to his own Alan Parsons Project albums and more. The first release is the Alan Parsons Imperial Grand Piano recorded in the style of Dark Side of the Moon using the same microphones and vintage EMI TG12345 mixing console. One of the most magnificent grand pianos in the world has been captured in all its 24 bit hi resolution chromatic multiple velocity glory and can now be played by any keyboard player regardless of their budget. Recorded at Mark Knopfler s British Grove Studios in London, the rare 97-key 9 and a half foot Bösendorfer Model 290 Imperial Grand was sampled by Alan Parsons and Dave Kerzner, founder of Sonic Reality, and the SR team in meticulous detail. The Alan Parsons Sample Project: Imperial Grand Piano will be available first in Yamaha s Motif format and will soon be released in popular software sampler formats such as SampleTank, Reason, Kontakt, Apple s EXS24 in Logic and more. Availability: Q1, 2014 from http://www.esoundz.com and Sonic Reality dealers and distributors world-wide. Formats: Motif XS/XF, SampleTank 3, Reason 7, Kontakt, EXS24 and more TBA. This product is a collaboration soley between Sonic Reality and Alan Parsons. No official affiliation with any of the other artists or companies mentioned is implied. All trademarks and tradenames are the property of their respective owners. All rights reserved. About Sonic Reality: Sonic Reality is a sound development/music software company founded in 1996 by producer Dave Kerzner. SR has been partner to many keyboard and software instrument manufacturers providing sounds for some of the most popular products used in music. Dave and SR have co-produced sample libraries with legendary engineer/producers and artists such as Ken Scott, Alan Parsons, Hugh Padgham, Allen Sides and Ocean Way, Nick Davis, Nick Raskulinecz, Neil Peart, Nick Mason and more. The main mission of Sonic Reality is to bring rare top quality studio instrument sounds to the computers and mobile devices of today’s musicians. With these tools musicians, songwriters and producers of all ages and levels of experience can afford to make music with inspiring album quality production elements created with iconic masters in the field of music.